UPDATE: San Luis Obispo County Sheriff deputies found Wilmar Tognazzini deceased near his residence Sunday morning. There was no evidence of criminal activity or suspicious circumstances, according to a press release. ORIGINAL STORY: San Luis Obispo County Sheriff’s deputies and volunteers are searching for 95-year-old Wilmar Tognazzini. Tognazzini was last seen on Thursday at his home in rural Morro Bay. He has been an educator, authority on Hearst Castle, musician and author. Officials are asking anyone with information as to Tognazzini’s whereabouts to call the sheriff’s department. In the warm hold of your lovin’ mind. 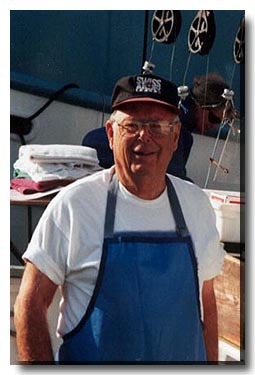 He was a TREASURE ……a Morro Bay TREASURE for sure. Loved hearing him at the Dockside Two….just a wonderful man. His wonderful family is a tribute to all his guidance and family values…..and I imagine he touched many of us in many ways….in personal ways….surely a life so well lived. Thank you Mr. Tognazinni for all the ways you enriched and touched each and everyone of us in your very special way! Godspeed and many blessings….and my heartfelt condolences to all of the Tognazinni family. Great family and legacy. RIP and condolences to the family! Wilmar Tognazinni was one of the most knowledgeable, generous, kind and interesting people that Morro Bay has ever seen. He leaves a large legacy behind. Between family and the many students that he helped while he was the principal of Morro Bay Elementary, he has so many people who will miss seeing him. He was a great believer in learning and wrote a history of San Luis Obispo County which can still be found in the libraries today. He loved music and sharing with people. Morro Bay has lost a real treasure. The news said there was, but he was found close to home, not sure how. Very sad story and a huge loss to the community. Prayers for all who have been touched by the loss, RIP.